Khao man gai is the Thai version of Hainanese chicken rice. This steamed chicken and rice dish is extremely popular in Singapore, Malaysia, Thailand and Vietnam. The Thai version, Khao man gai, translates as oiled rice with chicken. To make this dish, a whole chicken is simmered in water with salt, sugar, garlic, ginger, and pandan leaves. The jasmine oiled rice accompanying the chicken is made by sauteing the rice with shallots, garlic, ginger, galangal, and pandan leaves in chicken fat then adding broth. This makes the rice flavorful and gives it its oily texture. The dish is served with sliced cucumbers, fresh cilantro, and sauce made of soybean paste, soy sauce, garlic, ginger, red eye chillies, and white vinegar. An excellent primer for making khao man gai is offered by Nong Poonsukwattana of Nong’s Kaho Man Gai in a video I found on her website. A cup of chicken broth with thickly sliced daikon is served on the side. 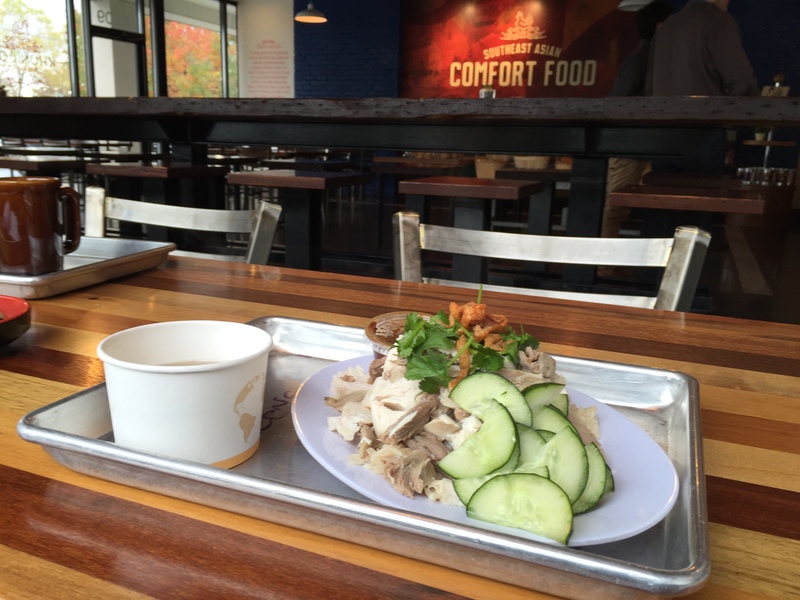 My first encounter with khao man gai was a lunch I had at Nong’s Khao Man Gai in Portland. When I moved to the area, I began researching food trucks. Nong’s was always listed as the best. I was a bit skeptical. What could be special about steamed chicken with rice? Finally, my curiosity took over and I headed to Nong’s storefront in Portland. It was amazing — it was one of those meals where I just sit and eat slowly and hope that it never ends. So, when I noticed that the owners of Ginger Pop were opening a restaurant for khao man gai I was excited. Khun Jo’s has a fresh, modern, clean look to it. The whimsical Khun Jo’s chicken symbol is placed on different parts of the walls. Before reaching the counter there was a nice variety of Khun Jo’s teas and baked goods neatly organized and tastefully packaged. I ordered at the counter. Khun Jo’s has a short menu — the main dishes are khao man gai (steamed chicken and rice), khao gai todd (fried chicken and rice), peek gai tod nahm pla (fish sauce marinated fried chicken wings), and khao kamoo (stewed pork leg, egg and rice). Khao is the Thai word for rice; so, there is a clear focus here — chicken or pork and rice. I was a bit tempted by the fried chicken; however, I am always on the lookout for quick, inexpensive, healthy dining. And, I was dying to try their khao man gai. The food was brought to me shortly after I ordered. It was a chilly day; so, I went for the chicken broth first. The broth was warm. It had a rich chicken flavor enhanced by a bit of ginger and garlic. The two thick slices of daikon at the bottom of the broth were tender and toothsome. The soup was soothing and revitalizing — the perfect thing to sip on a cold day. My attention then turned to the khao man gai. It looked a bit mixed up. I am used to neat slices of chicken placed carefully together; but, I don’t mind a messier looking dish if it tastes good. 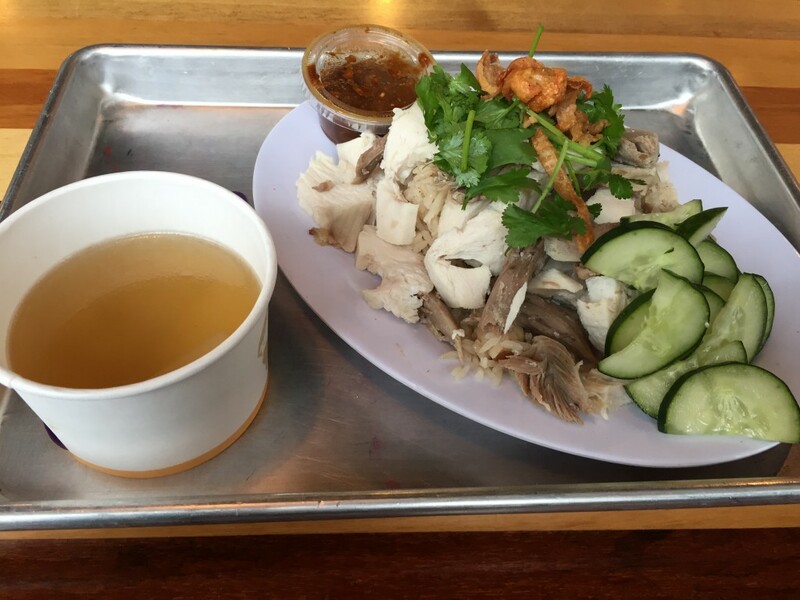 The choices of chicken for khao man gai are white meat, dark meat, or mixed type of chicken. I opted for a mix of white meat and dark meat. Unfortunately, the chicken was overcooked — it was chewy and dry. The other components of the dish — rice, sauce, garnishes were good. The rice was a good quality jasmine rice perfectly cooked (just the right amount of firmness and tenderness) and seasoned (nice garlic and ginger flavors). The sauce was very good — it had a nice salty and sweet flavor with a good amount of ginger and just a hint of chile. The cilantro was fresh. The cucumber slices had a bit of a funky flavor, lacked a good crunch — they were not very fresh. Despite the fact that the rice, the sauce, the soup, and the fresh cilantro were all good — they could not disguise the fact that the the chicken was overcooked. The dish is topped with crispy, fried chicken skin — this is not a traditional topping. But, who doesn’t like a bit of hot crisp chicken fat? It made me think that maybe I should have ordered the fried chicken. I really enjoyed being at Khun Jo’s and I would love to be able to get a good khao man gai on this side of the river. If the chicken was moister, I would be at this restaurant all the time. Khun Jo’s is located at 2100 SE 164th Avenue, Suite A-109 in Vancouver. Their hours are Monday through Saturday 10:30 am – 8:00 pm.